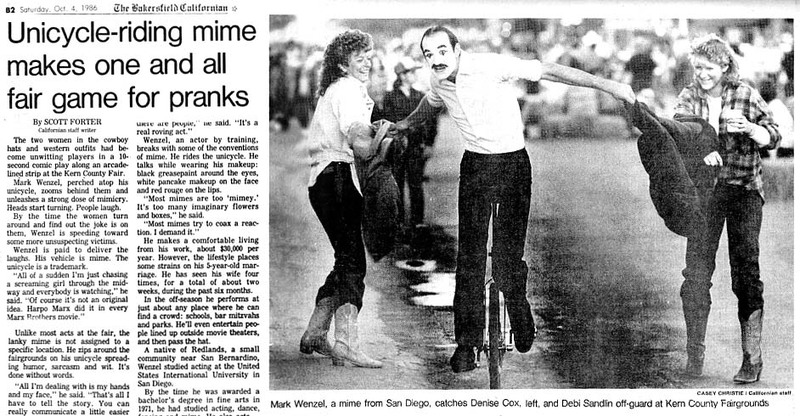 Mark Wenzel first appeared at a public park in San Diego, California, juggling, unicycling, mimicking the passersby and passing the hat. 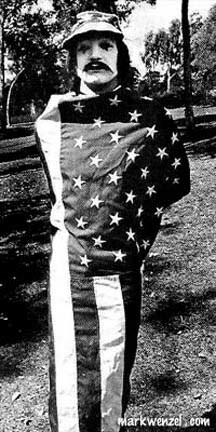 He quickly became a legendary street performer. 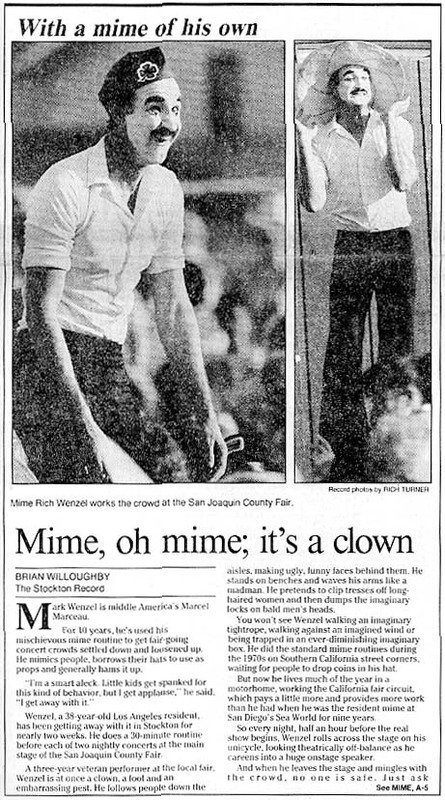 Mark made his professional debut as the official mime of the World's Fair in Spokane, Washington. 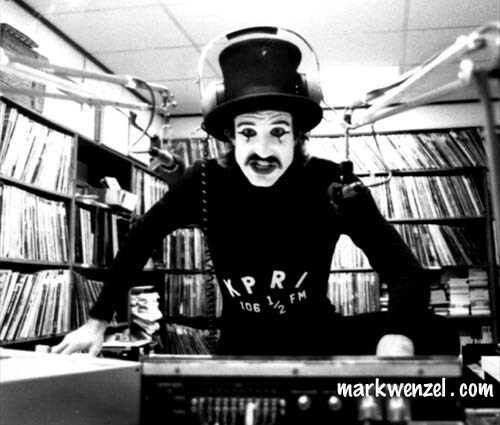 Returning to San Diego, he worked with radio station KPRI opening every rock concert that came into town for over two years. 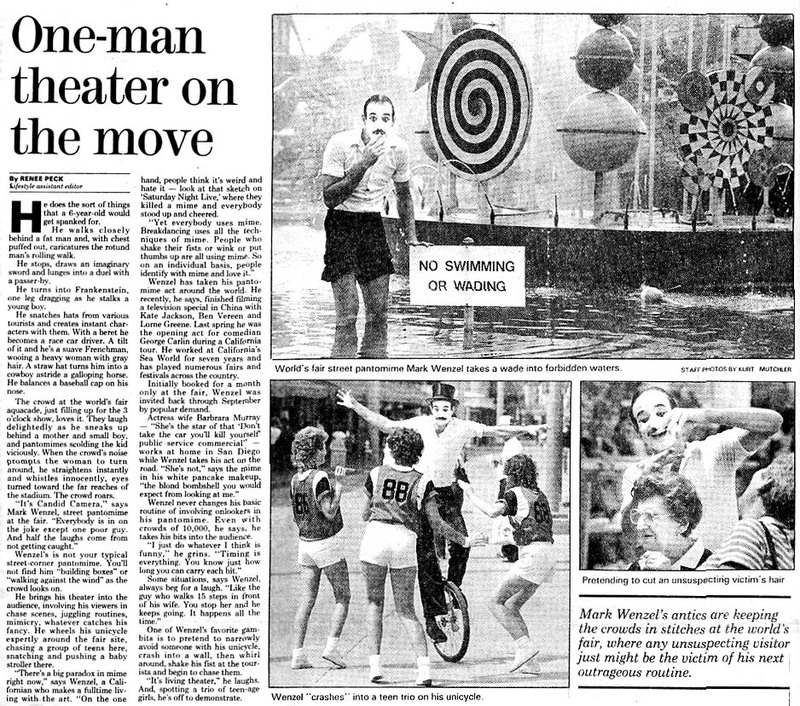 Mark pioneered the concept of mime performances at theme parks, becoming the resident mime at Sea World of San Diego where he entertained over a million visitors a year for eight years. 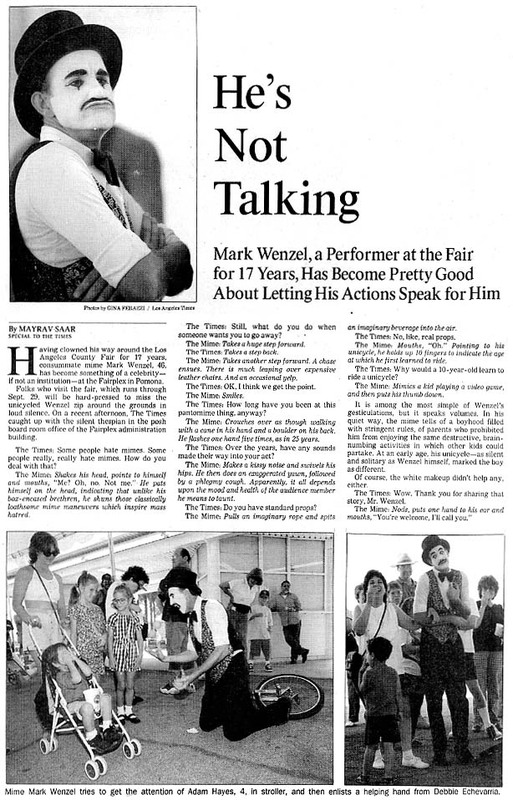 Impressed by his popularity at Sea World, fairs throughout the Western States hired Mark to open for headline talent in their massive grandstands. 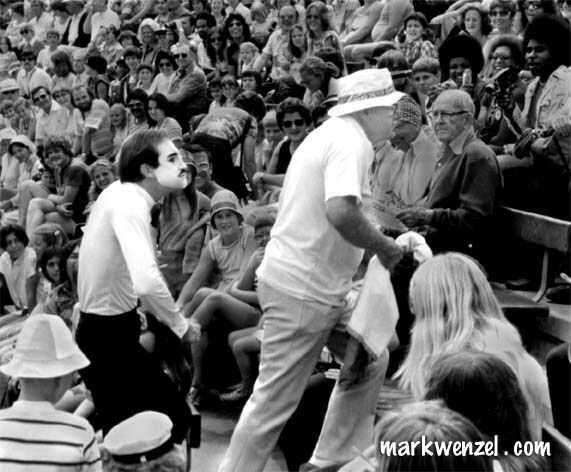 These shows, performed before crowds of up to ten thousand people have became a welcome warm-up act ever since. 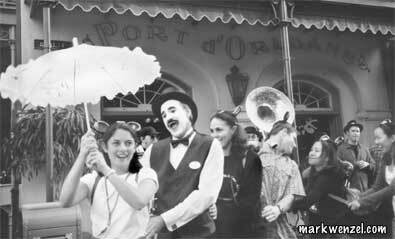 Mark is probably best remembered as the resident mime at Disneyland for many years, yet he has worked at all the major California theme parks including Knott's Berry Farm, the Queen Mary, Universal Studios Hollywood and Six Flags Magic Mountain. 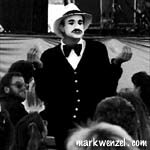 With performances at hundreds of fairs and festivals and theme parks, Mark is easily California's Favorite Mime. 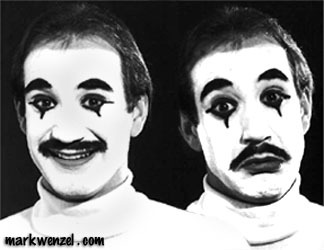 Mark was named the official mime of the New Orleans World's Fair, and at the Vancouver World's Fair, many people coming to the Royal Canadian Mounted Police Theatre stayed only to watch his pre-show entertainment. 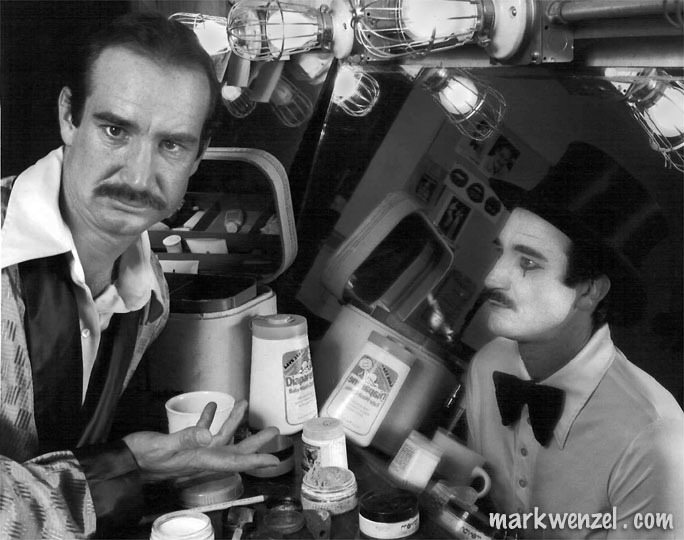 Over the years, Mark created a stage show to compliment his street performing, and he has played such major clubs as The Comedy Store, The Ice House and The Magic Castle. This popular show has also been seen on tour across the country at many schools and universities. 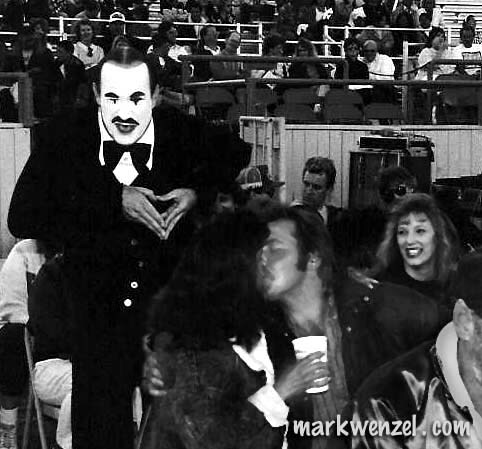 Mark has performed in such varied places as the U.S. Senate, transatlantic cruise liners and Circus Connelli in Switzerland. His work has taken him to Japan, China, Indonesia, England and Mexico. He opened a series of concerts for HBO, has been featured in Comic Relief, the Montreal International Comedy Festival and in various TV shows and commercials. 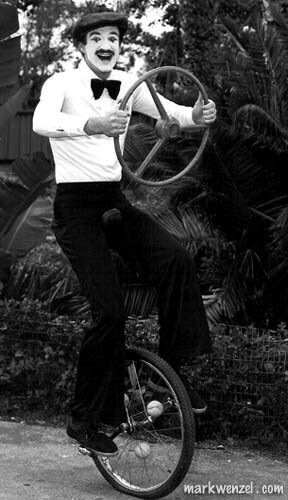 Whether riding a unicycle, juggling, or fighting an imaginary duel, Mark's rubber face and body make each moment a frenzied fantasy. Delighting both adults and children, his antics create laughter wherever he performs.